Ernest Tokpah recalls the toll Ebola took on his family during 2015 and 2016 in Ganta, Liberia. "Ganta was on fire because of the Ebola," he said. "We stopped eating together, we stopped shaking hands, and people practically stopped talking to each other.” Tokpah, a faculty member at Ganta United Methodist School, is raising four children left orphaned when his sister and her husband died of the disease. Photo by Mike DuBose, UMNS. Reports of a recent outbreak of Ebola leading to 25 deaths in the Democratic Republic of Congo has brought the disease back into international headlines, just two years after the epidemic that killed more than 11,300 people in Guinea, Liberia and Sierra Leone. Liberians continue to recover from that crisis even though the country was declared Ebola-free in January 2016. The road back to “normal” has been a long one. 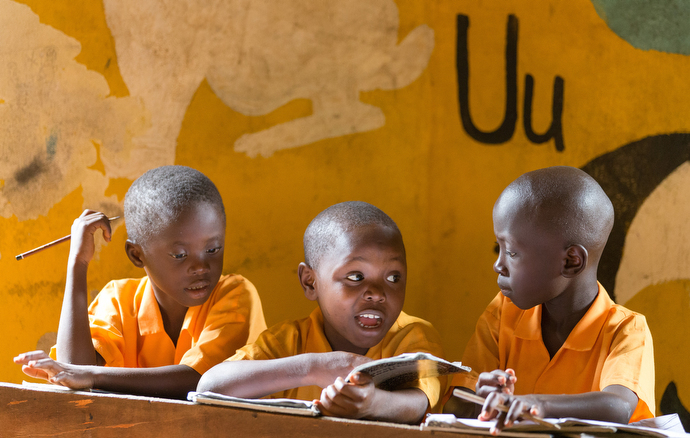 Students work together on spelling words in the combined kindergarten and first grade classroom at the Bishop Judith Craig Children's Village in Duahzon, Liberia, some two years after the country was declared “Ebola-free.” One of the areas hardest hit by the crisis was education, with many students missing most of the 2015-2016 school year. One of the areas hardest hit by the crisis was education. With the entire country seemingly at a standstill while trying to halt spread of the disease, schools were closed from August 2015 until February 2016. The loss of most of a school year put students behind, and when schools reopened, many students lacked the fees to return because their parents had been out of work during that time or may have succumbed to the disease. 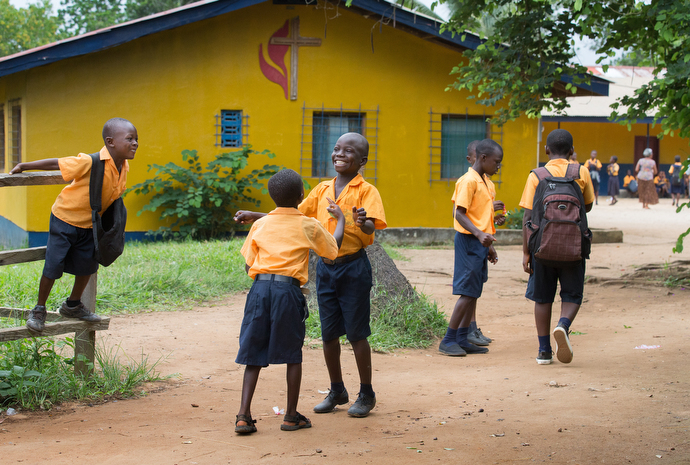 Students enjoy a few moments in the schoolyard before classes begin at the Ganta United Methodist School. 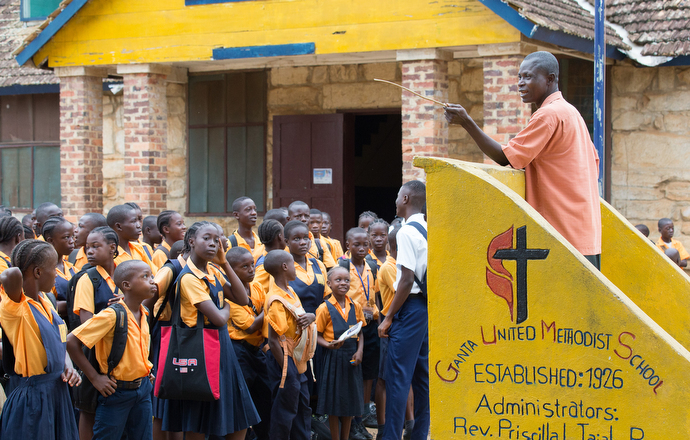 When Ganta United Methodist School reopened after the five-month closure, fees for students were waived, which resulted in a shortfall of $2 million LRD (about $14,500 USD), said James Y. Koroloroblee, the school’s interim acting principal. “We had to find a means for people to pay so we offered jobs cleaning the campus during vacation time in exchange for fees. We had to keep them in school,” he said. Interim principal James Y. Koroloroblee presides over the morning assembly at Ganta United Methodist School. 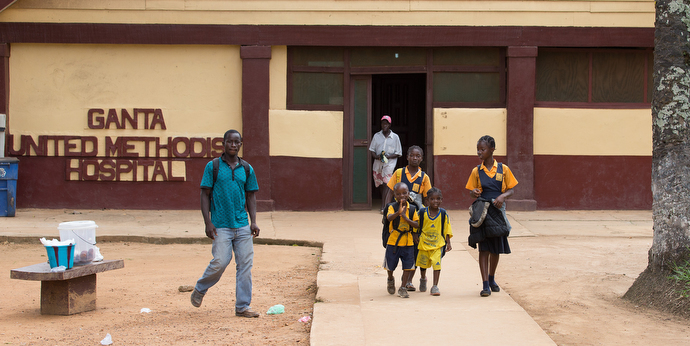 The school was closed for five months during the 2015-2016 school year due to an outbreak of Ebola. Abullah Buhmean, a 17-year-old student at the school when United Methodist News Service interviewed him in June 2017, was one of the students who benefited from a work grant. 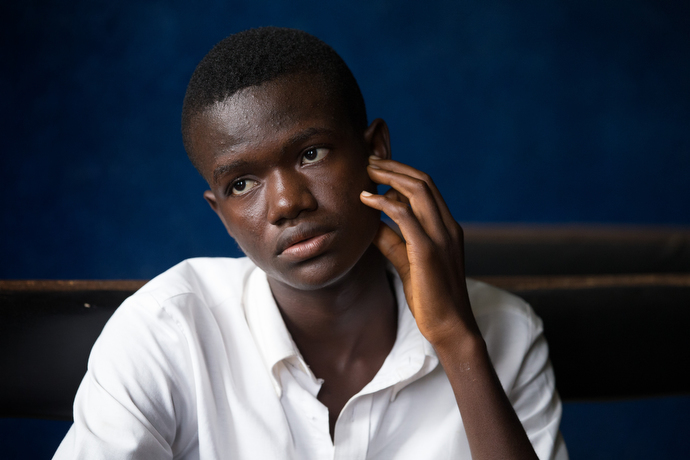 Abullah Buhmean, 17, was able to continue his education at Ganta United Methodist School after his uncle died of Ebola thanks to a work grant from the school. “We were quarantined for 21 days when it was confirmed by the hospital that my uncle had Ebola,” Buhmean said. 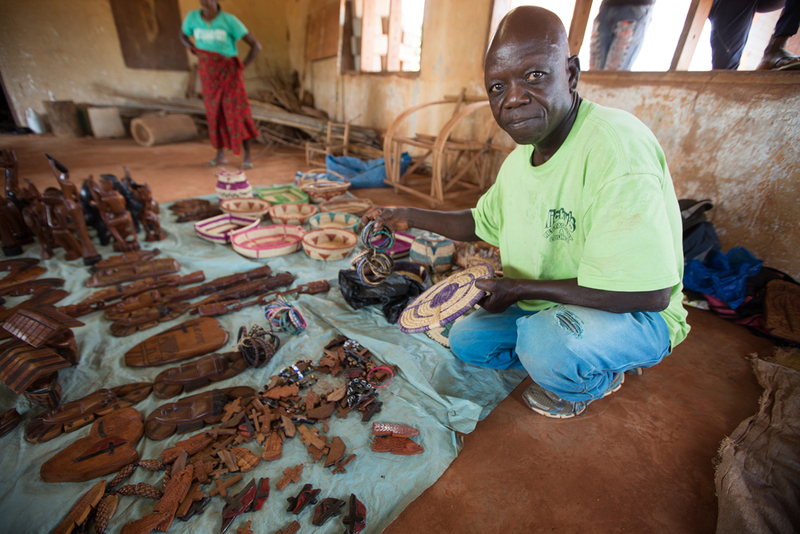 John Farr displays carvings and baskets that he makes to help support himself at the Ganta Leprosy and TB Rehab Center in Liberia. Read story, Liberian leper colony a lifetime commitment to care. Read a profile of Bishop Samuel J. Quire. See photos from United Methodist News Service's trip to Liberia on our Flickr page. 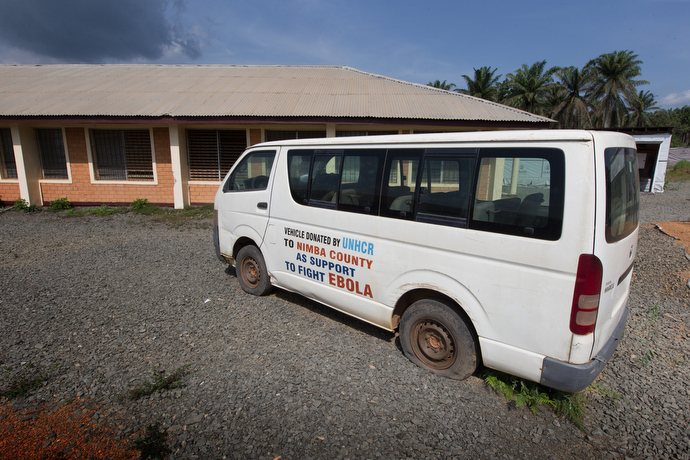 While teachers and faculty were trying to help students regain their lost lesson time, many of them were also coping with personal difficulties brought on by the Ebola epidemic. Ernest Tokpah, an agriculture field supervisor at the school, told UMNS in June 2017 that he had adopted his sister’s four children after both she and her husband died from the disease. Stigma about Ebola made an already difficult situation even harder to deal with. “When my sister and her husband died and I brought the children home, the entire community shunned me and the children, and we were left to do things on our own,” he said. Tokpah said that fear and lack of credible health information led people to alter almost every facet of daily life. Johnson N. Gwaikolo, former president of United Methodist University in Monrovia and now a member of Liberia’s Legislature, told UMNS in June 2017 that Ebola set the school back, and reported losing three or four students to the disease. The university added several hours to class time to catch up, and offered payment plans to students struggling to come up with funds for tuition. 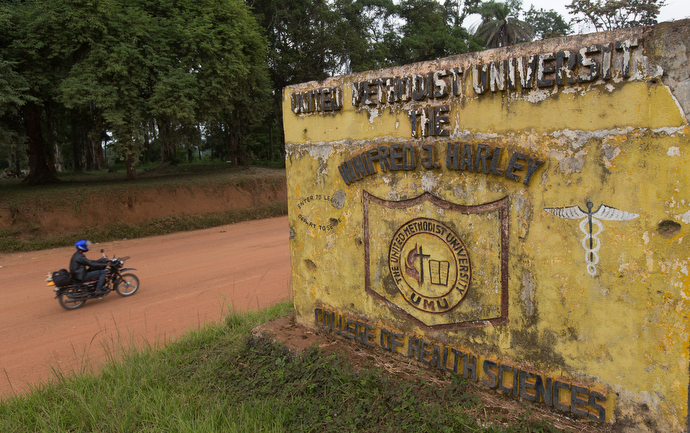 A motorcyclist rides past the entrance to the former United Methodist College of Health Sciences in Ganta, Liberia. Although the nursing school moved to a new campus nearby in February, the Ganta United Methodist Hospital continues to offer medical care at its facilities on the church’s mission station. The church also played a role on the medical front line of the outbreak. During a June 2017 visit, staff at Ganta United Methodist Hospital shared their experience with United Methodist News Service. Vulu said one person affected by the situation got on the radio, frustrated that he was kept in his home with no support. A van donated by the United Nations to help fight Ebola rests on flattened tires at a former containment facility near the airstrip at the United Methodist Ganta Mission Station in Ganta, Liberia. Ganta Hospital is in a fairly remote area. The next hospital to the north is 26 miles away; a specialized hospital is about 60 miles away. When the breakout occurred, hospital staff mobilized to address the crisis. 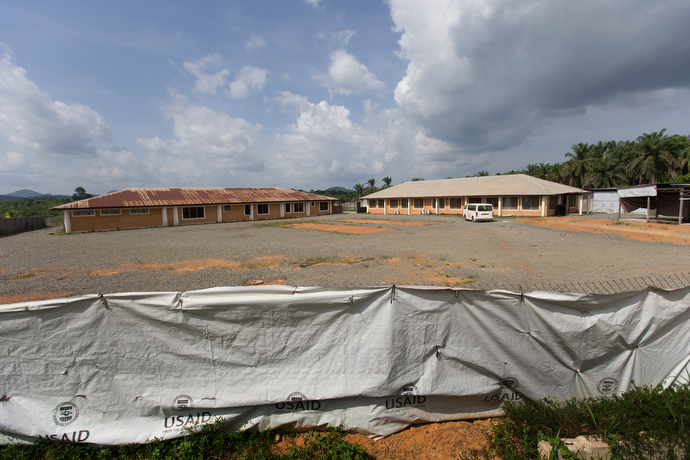 An Ebola containment facility constructed by the Nimba County Health team and Project Concern International lies unused at the Ganta Mission Station. 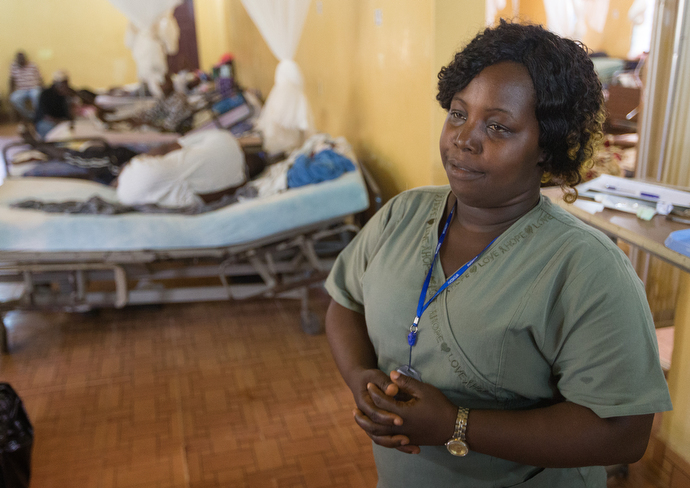 Ganta Hospital staff assisted the medical team running the facility during the Ebola crisis. When the number of Ebola patients rose dramatically and there was no Ebola Treatment Unit set up yet, the hospital allowed the local government to use its eye clinic. Later, the Nimba County Health team and Project Concern International constructed a large containment facility on a nearby rural airstrip. Ganta Hospital staff assisted the medical team running the facility. Eye and vision problems have surfaced in Ebola survivors, but Ganta’s eye clinic tends to refer anyone with such issues to a facility in Monrovia. “Their treatment is a specialized process and we’re not equipped to provide services for them,” said Clarence Menleh, supervisor of the eye clinic. 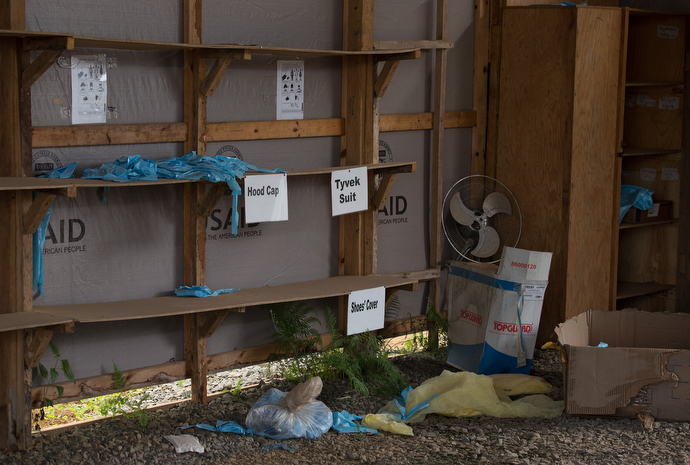 Protective clothing is scattered about at a former Ebola containment facility at the Ganta Mission Station. As the hospital lacks a facility to fully isolate patients, its role is often one of referring patients elsewhere. There have been no confirmed cases of Ebola since the outbreak was declared over, but staff now have procedures in place, said Agatha Neufville, the hospital’s director of nursing. Ganta United Methodist Hospital is among the church's health and education facilities that are helping the country recover from the Ebola crisis of 2015-2016. The hospital, which serves a fairly remote area, has instated new isolation procedures following the crisis. They take everyone’s vitals and temperatures. Even visitors have their temperature taken before being allowed in. Patients with fever are placed in a separate area and staff are required to don preventative materials before seeing those patients. If symptoms don’t get better after a few days, patients are transferred to clinics better suited to issues like hemorrhagic fever. Agatha Neufville recalls that when the first Ebola patient arrived at the United Methodist hospital in Ganta, the staff did not know what they were facing. Neufville, director of nursing at the facility, said none of her staff contracted the disease through their work. "God has been with Ganta hospital," she said. Butler is a multimedia producer/editor and Mike DuBose is staff photographer for United Methodist News Service. Julu Swen, a communicator in Liberia, contributed to this report. News media contact: Vicki Brown, Nashville, Tenn., (615) 742-5470 or newsdesk@umcom.org.